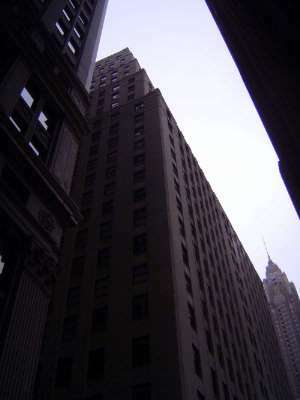 The mighty masonry piles of Wall Street never die, they just become apartment buildings. 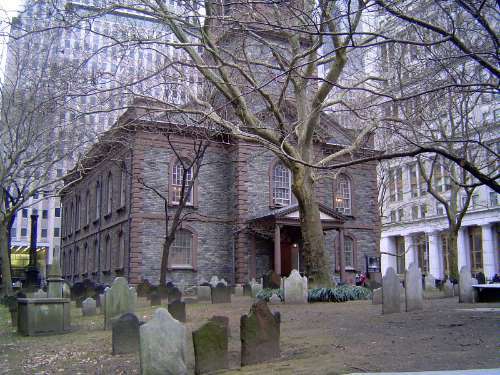 This is St. Paul's Chapel, Manhattan's only remaining colonial church. The builders knew their classical monuments, and up top they put a steeple modeled on Greece's Choragic Monument of Lysicrates. The church seen from the west. 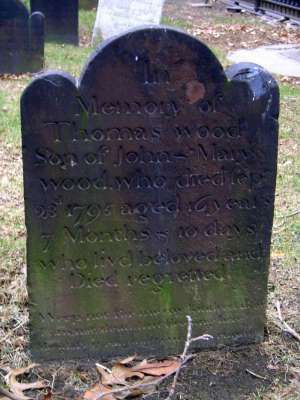 The stone is schist quarried on the site, but the steeple was added in 1796, roughly 30 years after the rest of the church. An epitaph verging into formulaic blandness. 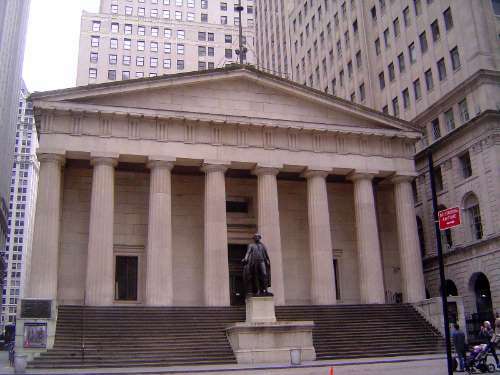 A few blocks away and across from the New York Stock Exchange, Federal Hall appears almost as old as St. Paul's. It's actually older, dating from 1700, but the classical facade was added in 1842, during the national craze for Greek Revival architecture (the year when that phrase was coined). The statue of Washington marks the site of his inauguration. The rear side. 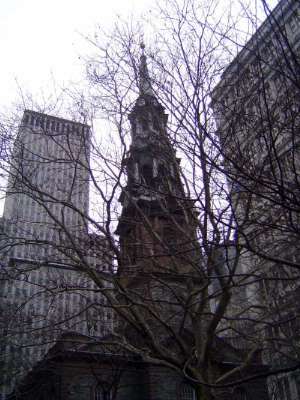 As the steeple of St. Paul's echoed the monument of Lysicrates, so this building is a near-copy of the Parthenon, minus the sculpture. 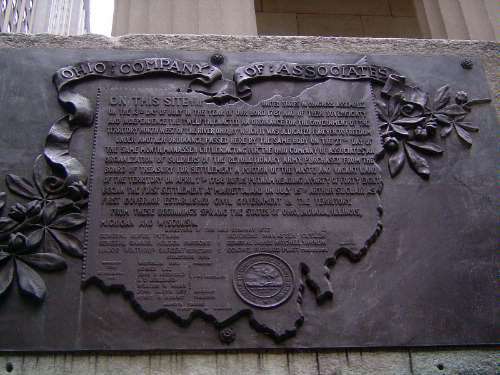 Bolted to the building is this reminder that the settling of the Midwest began with decisions taken here. 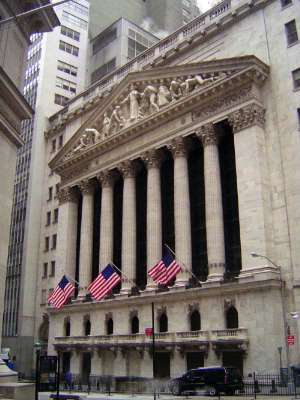 Kitty-corner to Federal Hall, the New York Stock Exchange, completed in 1903, is a good example of architectural tradition gone awry. The columns are jacked up so that nobody can enter the building by walking between them. 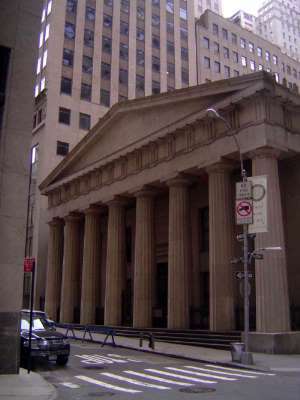 Behind Federal Hall, the old Chase Manhattan Bank at 20 Pine does away with most of the classical dressing. 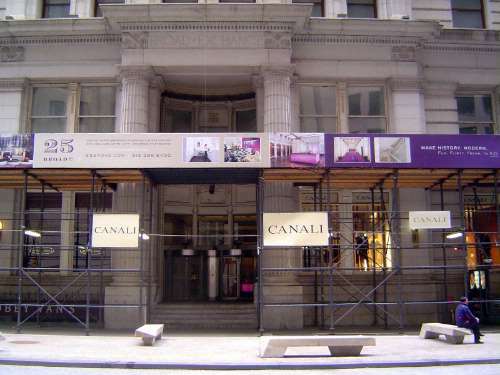 It also has lost its namesake tenant. And so? 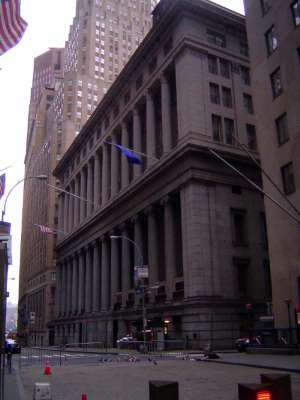 The Merchant's Exchange, at 55 Wall Street, was begun in 1841 by Isaiah Rogers and replaced a building destroyed by fire in 1835. The new building became the Custom House in 1863. 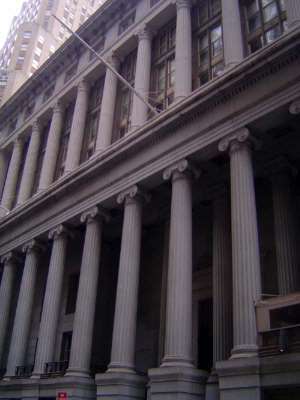 The lower columns are monoliths, unlike Federal Hall (or the Parthenon, for that matter). 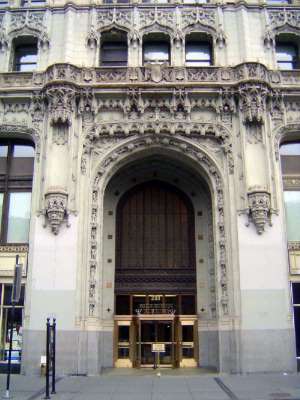 Sixty years later, the First National Bank, which occupied the building at that time, ordered a second story from McKim, Mead & White. You mean you didn't notice that the two rows of columns don't match? Now you know why they don't. Inside, the main banking hall is described in the AIA guide as "a facility unequaled in America." 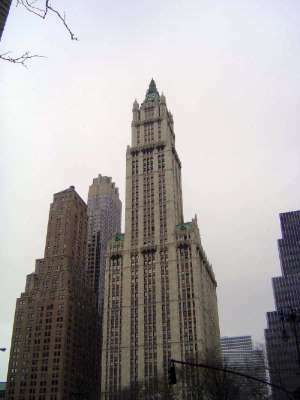 That view has been almost entirely lost, now that the building has been converted to residential use under the name Cipriani. 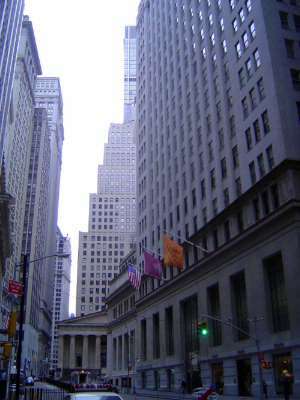 The view down Broad, with the old Chase Manhattan building behind Federal Hall and the stock exchange barely visible to its left. On the right here, the five story J.P. Morgan building of 1914 and, closer, the 42-story Equitable Trust Building, now Starck's Downtown. 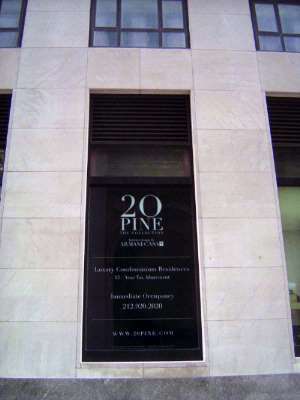 For almost 70 years after its completion in 1902, this building at 25 Broad Street was Paine Webber's headquarters. Now redeveloped by Swig Equities, it's 346 apartments. 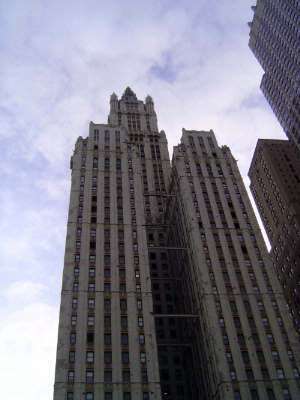 The nearby Woolworth Building, completed in 1913, was sold by Woolworth in 1998 to Witkoff Group, which set out to convert it, too, to apartments. Some of those apartments will have better views than others. They'll all share an opulent entry. To its north, a grim exercise in mimicry, like a digital copy of a great singer's voice. 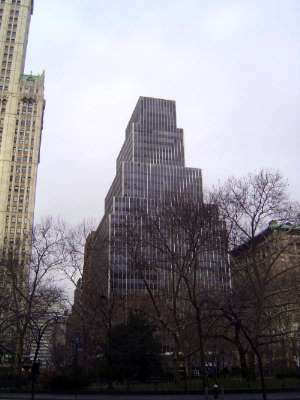 The building, at 250 Broadway, was designed by Emery Roth and completed in 1962. Ironically, it is the home of the city's housing authority. 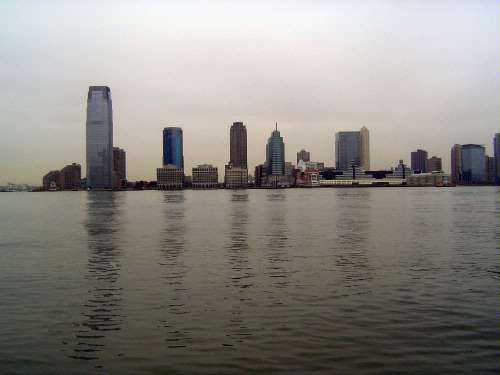 Across the Hudson River, a tower by Cesar Pelli rises at 30 Hudson Street and houses Goldman Sachs.